New entry level Sony SLT coming soon? 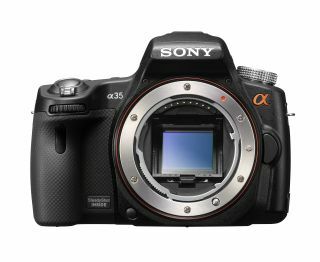 Sony has listed its a35 camera as a "previous model"
Sony has listed its Sony a35 DSLT camera as a "previous model" on its official website, leading to speculation that a new entry level camera could be unveiled soon. Last year, the Sony a33 and Sony a55 were also discontinued, some months after the announcement of the most recent a77 and a65 cameras, which were launched in August. This leaves Sony with just two cameras in its "current" line-up of translucent mirror models. It is thought that a "pro" camera using the SLT technology is likely to be on the cards, especially since Sony introduced a new 500mm professional lens. It's been a relatively quiet few months for Sony, which announced two new DSLTs and two new compact system cameras last summer. Sony is known for announcing several cameras at once, so a large announcement could be on its way. The a65 is a pared down version of the a77, but both sit in the "enthusiast" part of the market. A budget version of the cameras would likely be a welcome addition for many photographers keen to harness the advantages of using a translucent mirror. Sony is known for producing high resolution sensors, with the a65 and a77 both sharing a 24.3 million pixel APS-C sized sensor. It seems likely that a budget model would also feature a relatively high pixel count. The a35 featured a 16.2 million pixel sensor, so an entry-level 20+ megapixel camera seems like a likely proposition. Stay tuned for more updates on Sony camera releases as and when they happen.